Picture Sugar Cookies are like no other! Our delicious all-natural butter-based sugar cookies are freshly baked to order. Our Confectionary Artisans drench each cookie in a luscious coat of Belgian White Chocolate. Your 100% edible image -logo, photo or original artwork- is added to each cookie, making these confectionary creations truly one-of-a-kind! A "picture frame" is made from non pariel sprinkles, chosen by our cookie artists to complement your corporate image. 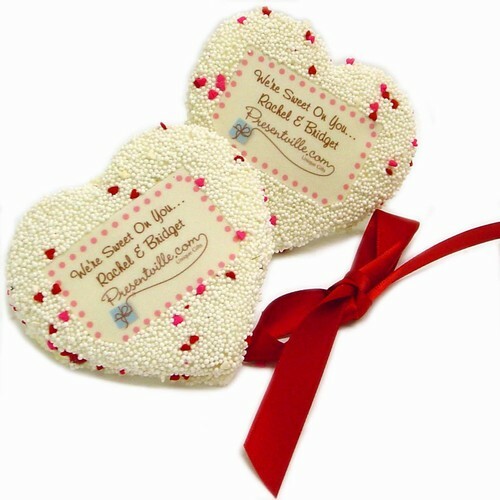 Each exquisite heart-shaped cookie is 3.5", a deliciously memorable treat for any occasion! Shelf-life on these cookies is about 4-6 weeks when un-opened and stored properly. Add a ribbon for picture perfect party favors!